“Residential School Memorial” created by the students of St. Joseph’s College School (TCDSB). 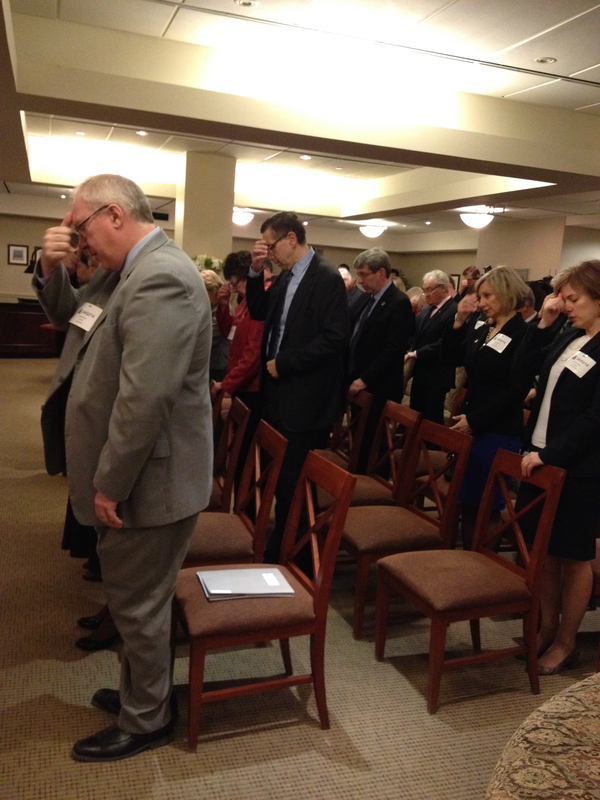 Photo credit: OCSTA President, Patrick Daly. Once again the Toronto Catholic District School Board’s St. Joseph’s College School was well received at the internationally acclaimed all-night art event called Nuit Blanche. 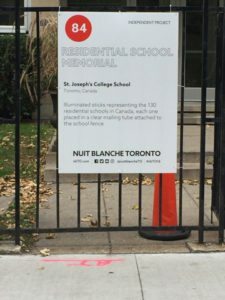 The leading Toronto website “BlogTO” selected the TCDSB school’s submission as one of the best Nuit Blanche exhibits featured this year. 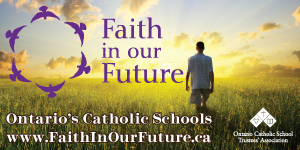 St. Joseph’s College School students focused on creating art exhibit that recognized Canada’s First Nation culture while speaking to the tragic legacy of residential schools. Entitled “Residential School Memorial” the exhibit featured illuminated talking sticks representing the 139 residential schools in Canada. 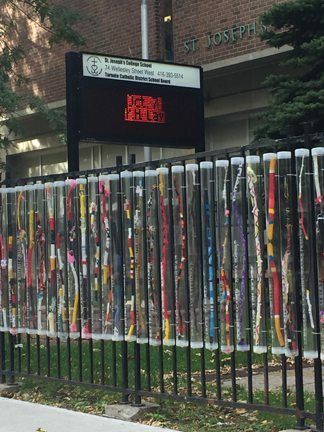 Each stick was placed in a clear mailing tube attached to the fence that runs alongside the front of St. Joseph’s property on Wellesley St. In Native culture, the “talking stick” is a symbol, or artifact, which allows the speaker to assert their right to speak. It has strong cultural and spiritual significance between First Nations peoples and is understood to command authority. It is a symbol of dialogue and story telling. After Nuit Blanche Toronto, the talking sticks will be distributed to different schools so that they might help to continue the dialogue and to open up conversations about a dark period in Canadian History. Presented this year on Saturday, October 1, Nuit Blanche attracted thousands of visitors to the more than 300 outdoor art exhibits displayed across the city.